The dynamic duo scour the streets of Gotham City in this tremendous Batmobile. Tandem seating allows Batman and Robin to ride side by side. Robin's seat becomes a detachable motorcycle with spring-loaded wings that swing out when the cycle ejects. 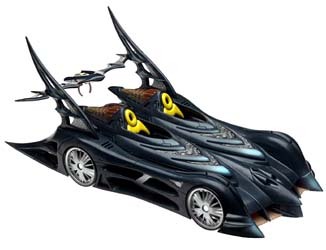 The Batmobile's rear wing detaches as well to become Batman's jetpack.